We are grateful to our local news media for sharing our efforts with their readers and the community at large. 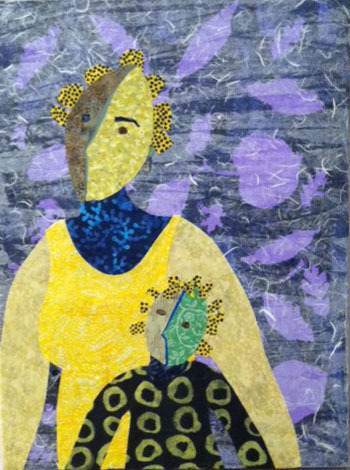 Click the links below to read the articles and enjoy watching a quick video montage of the fourteen pieces from the show. Last - but not least! Right before the show, one of our participating artists and the manager of The Artist's Den - Michelle Morey - was unable to finish her piece due to an urgent family matter. We wanted her to still have a presence in the show, so each artist contributed an item that reflected some aspect of Michelle's narrative and the 13 items were assembled together into a wallhanging for her. Click here to download all the artists' narratives. Click here to download all of the artists' narratives that further describe their work. Catherine included interviews from friends who also experienced a "yellow alert." 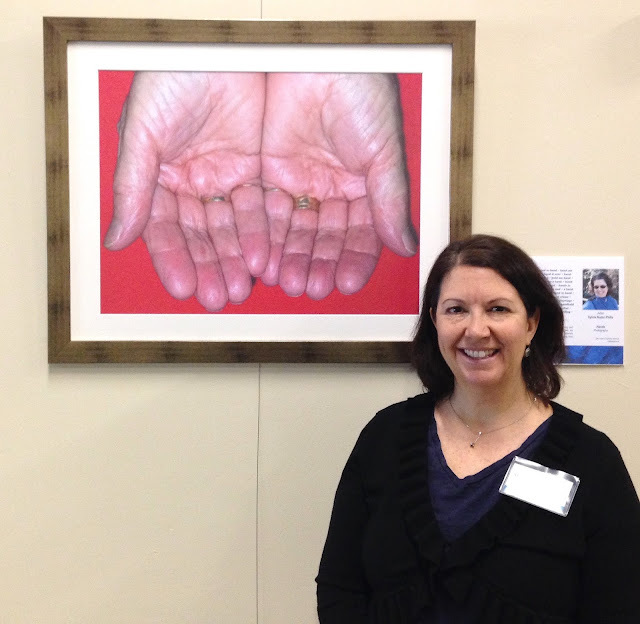 The opening weekend for our sight/unseen show was a resounding success! So many people came to see our exhibit - friends, family and the community at large. We are so grateful to all of the participating artists, to The Artist's Den and to all the tireless volunteers who helped make this show happen. We want to especially thank Sylvia Nuzzo Philis (CCofA founder, shown above at lower right wearing purple) for her vision of this show's theme on identity. sight/unseen is still on display this week (Monday—Thursday, 10am—2pm at The Artist's Den, 1913 Salvio Street in Concord) if you didn't catch us this past weekend. In addition to viewing intriguing and diverse works of art, you'll enjoy reading each artist's written narrative about their inspiration and approach to their work. Click here to download a PDF file of all the narratives. 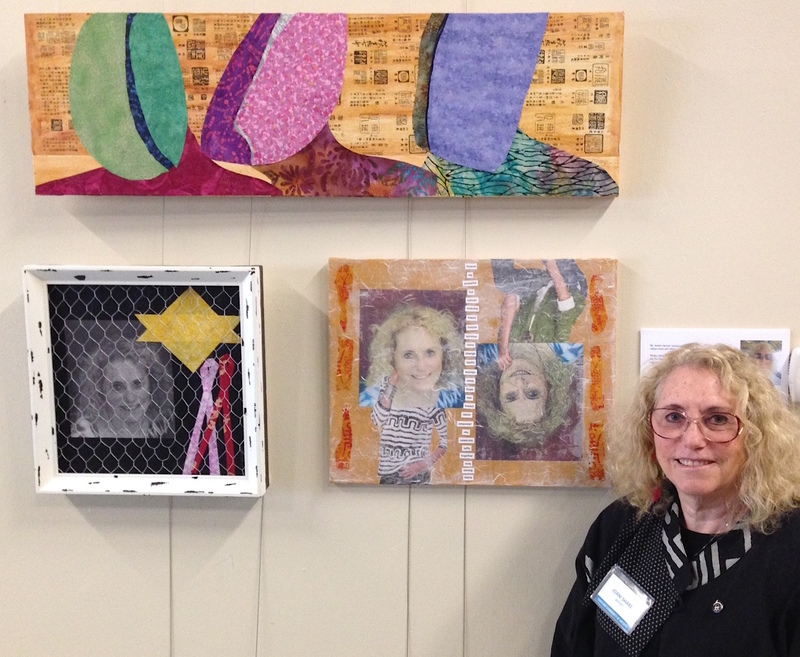 This week we'll feature all of the art here on the blog, starting with these four artists - Laurie, Joani, Sharon and Marie. Enjoy! 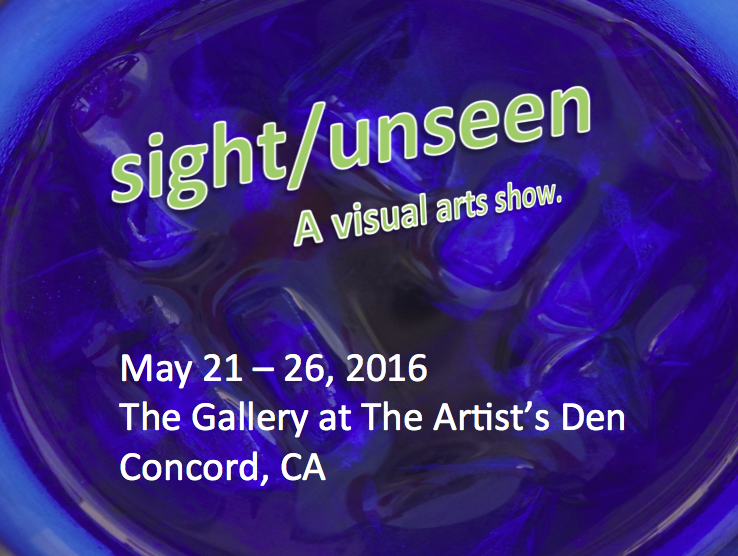 This month we are featuring interviews with the artists who are part of our upcoming art show -sight/unseen - at The Artist's Den in Concord, May 21-26, 2016. 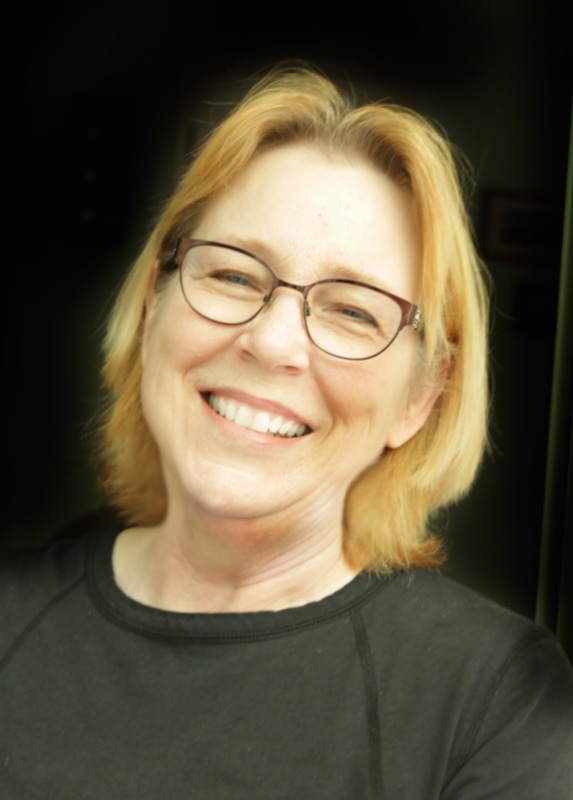 This is Lois Willhite - what do you like most about living in Concord? Concord has the natural beauty and the feeling of a rural community, with everything we need within a short drive from our home. Also there are the amazing views of Mt. Diablo to the east and San Pablo Bay to the west, with its fabulous sunsets. Concord has grown in size over the years and that rural feeling is no longer there, but the surrounding open spaces still inspire my appreciation for the beauty of the seasons with their changing colors, and for new opportunities. Our neighborhood is very family-oriented and the children of our neighbors now have families of their own; they continue to return and still consider our community to be home. What mediums do you plan to use for this show? I am a creative mixed media artist - I like needlework, crafting, drawing and painting. The subject and medium for my entry in this event is a bit out of my comfort zone. 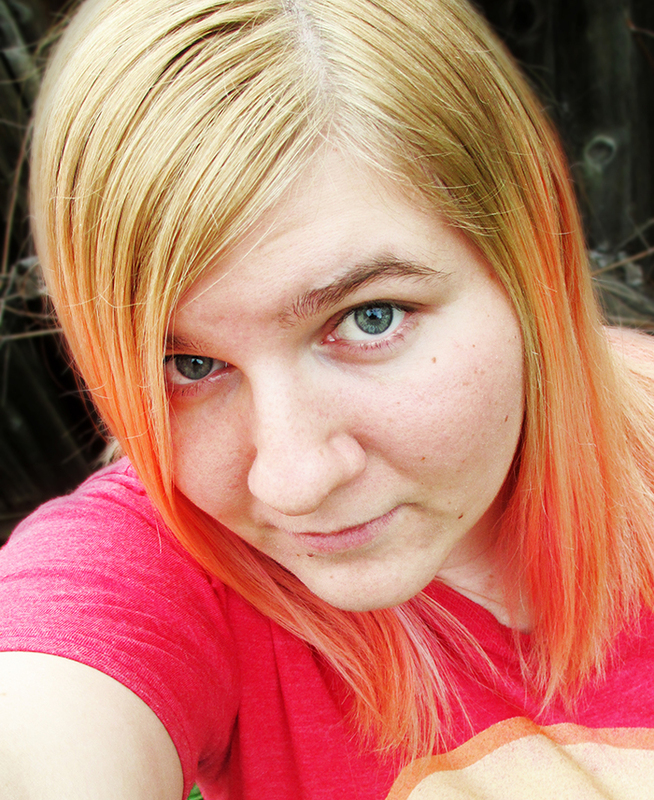 I will be using mixed media in the hopes of creating a collage effect with watercolor, pastel and/or acrylics. My oldest brother was the artist in the family. He became my mentor through his love for music and his daily sketches. I have had an interest for creative art from an early age and always used whatever medium was available. Drawing in the sand at the age of 5 was the beginning of my desire to become an artist. I loved all art projects that were introduced during my early school years and when I reached high school age, I enrolled in an art class by mail with the Artist’s Institute. During the years after graduation I lost the interest for turning art into my professional dream. Instead I married, got a job, and raised my children. Needle work was a necessity while I was growing up. The reward and self satisfaction from the completion of the projects is why I like it. Crafting is enjoyable because I like to work with different textures and new ideas, drawing is for my peace of mind, and painting is for the challenge. 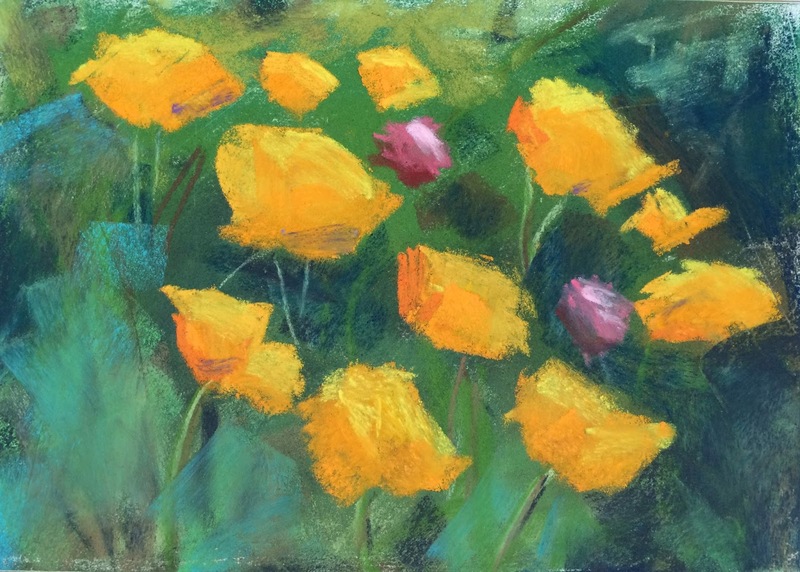 After moving to California and our children were in school, my artist neighbor and I enrolled in art classes at DVC, which revived my interest for the arts. Over the past few years I have taken classes within the Mt Diablo Adult Education system to advance my art to a new level. What advice do you have for the new artist? The only tip I have for achieving “complete satisfaction” would be to pick the medium of your choice and go for it. Don’t be afraid to try new ideas, but be true to what fits best for you. This is Emily Stepp - what do you like most about living in Concord? I’ve lived in Concord on and off since the start of my sophomore year at college in 2009. I have drawn inspiration from nature in the area, often taking photographs in parks to use as reference material later on. Cities without enough green space make me feel drained and claustrophobic, so I really enjoy our convenient access to so many parks and wildlife areas. I plan to tackle this piece with a mixed media approach. I often paint with acrylic on a flat plane, or I sometimes sculpt, but I don’t usually combine the two. I’m wanting to find a way to incorporate sculpture with a traditional flat painting. I think constantly innovating is the only way to truly improve. You have to keep challenging yourself or you’ll get stuck in a groove. Even if you never use a particular method again, it will better inform your future work. Any new techniques or materials you've learned about recently? I’ve been learning how to make 3-D digital models lately. It’s definitely out of my comfort zone, in that I had to learn an entire program and become accustomed to its limitations. I’ve taken several classes in the past to learn clay sculpture, so I had to translate that into my digital models. I have even used these 3-D models as reference material for 2-D work, since I can add dynamic lighting and poses. I’ve been making art since I was old enough to hold a crayon. 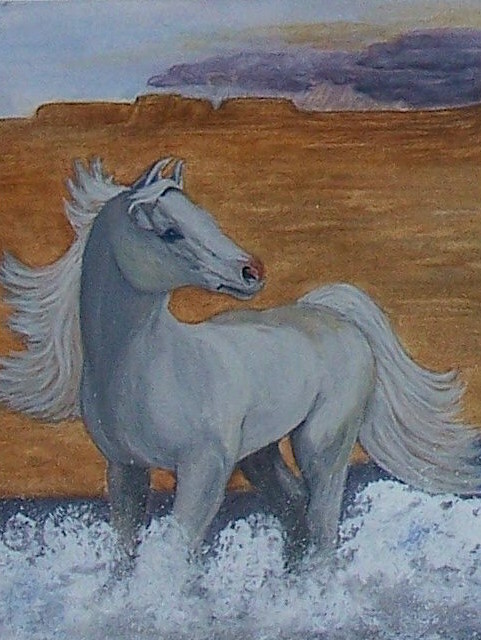 I became serious about art as a career in high school and enrolled in California College of the Arts in 2008. What's the best advice you've received as an artist? I would say that my first true artist mentor was Randy Chavez. He taught Illustration along with the History of Illustration. He was full of helpful advice and various pieces of wisdom. He encouraged us to practice as much as possible to fulfill our “ten thousand hours” that's needed to become an expert at something. His magic realism pieces are also an inspiration for me stylistically. What advice would you give a new artist? By far the best tip for a new artist is to practice. Keep drawing, sculpting, photographing - just keep doing it. You never start out being the best. You should never compare your art to anyone else’s, always compare your current work to your older work to see improvement. Only measure yourself against yourself. Most students think they need to avoid something they’re bad at, but that’s exactly what you should practice until it is no longer difficult at all. This is Joani Share - what do you like most about living in Concord? I have lived in Concord just shy of 1 year - since April 2015; prior to the move to California, my husband and I lived in Phoenix, Arizona for over 40 years. We moved here to be closer to family, which has been a great joy to us. The proximity to San Francisco and all that a large, world-class city has to offer has been inspiring and exciting. Being new to the area, everything is a learning curve from shopping to driving – exploring our new surroundings is lots of fun. Moving from the desert and extreme heat to milder temperatures has made living easier, and seeing actual seasons has been inspirational- the shock of fall colors and spring flowers is a contrast to the subtle changes found in the desert terrain. I love my new studio space, it is large, light and airy – it used to be a garage, but no more. With the sealing of the garage door, addition of windows and heating/cooling it is my favorite place to be – I am there all of the time. It will be mixed media. I started using my sewing machine to create art – making lines become dimensional. I love exploring new media and techniques, I have no fear of color and will try just about anything art-wise to see how it works with my ideas. I learned how to do monoprints using plexiglass plates. It was not something I knew, but instantly fell in love. 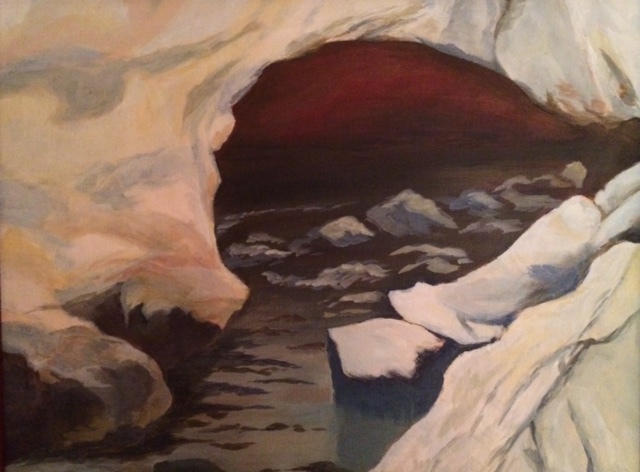 The technique I learned was untraditional – oil paint on dark paper – it was fascinating – different and forgiving. I learned to incorporate printmaking into many of my older pieces, without the use of a printing press. The new gel plate prints are helpful in creating texture and pattern to paper which can be used as is – or cut up. Experimenting is something I love to do. Myth 1: The ability to draw is inherited. This is one of the main reasons people believe they cannot draw or give up after only a few attempts. I am convinced that this is false. Myth 2: There is a right and wrong way to draw. There are learned techniques and approaches that will help you draw in ways that enhance your drawing skills. However, in art museums and art galleries you will see all manners of drawing, from precise to sloppy, from beautiful to ugly. Even art critics are in constant disagreement about what comprises good and bad art. Art students sometimes hand the same work to different teachers and get wildly divergent opinions. Unless you have been commissioned to do a certain drawing, it is not necessary to please anyone but yourself. Myth 3: Drawing is simply for pleasure and has no practical use. The process of creating art helps develop problem-solving skills, develops concentration and visual perception skills that are applicable in many other areas, and promotes relaxation and creative energy that is healing to the mental and emotional body. Myth 4: You can’t really draw if you have to look at a photograph. 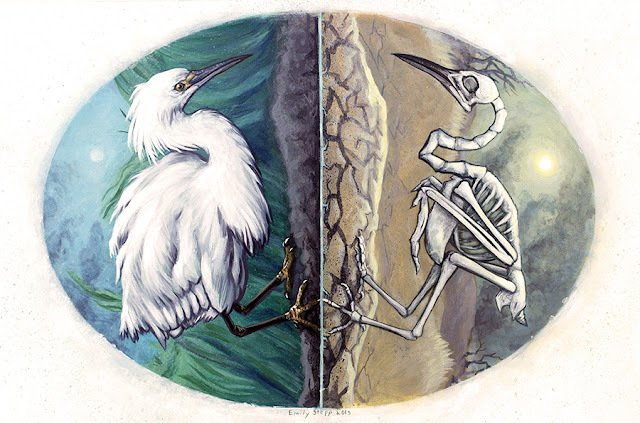 You cannot realistically draw the endless array of of animals, birds, and foliage that exist from your imagination alone. If you cannot locate the subject or object you wish to draw, it is okay to use photographs as a reference tool. You can use these references to create your own works of art. Myth 5: Real artists successfully draw what they want without making mistakes. Nothing could be further from the truth. Most artists are dissatisfied with their preliminary works. Sometimes they do a composition over and over, adjusting parts they don’t like. “If a professional artist does five drawings, how many do you think he or she will like enough to frame?” The typical answer is two at the most. Give yourself freedom to explore the way professional artists do. Only with freedom will you maximize your progress. Finish the drawings you don’t like, without trying to hide them or apologize for them. This will empower you to learn from your efforts and take advantage of the magic that originates in so-called mistakes. What advice do you have for a new artist? It takes a long time to create art – don’t ever get discouraged! If you think you made a mistake, fix it. 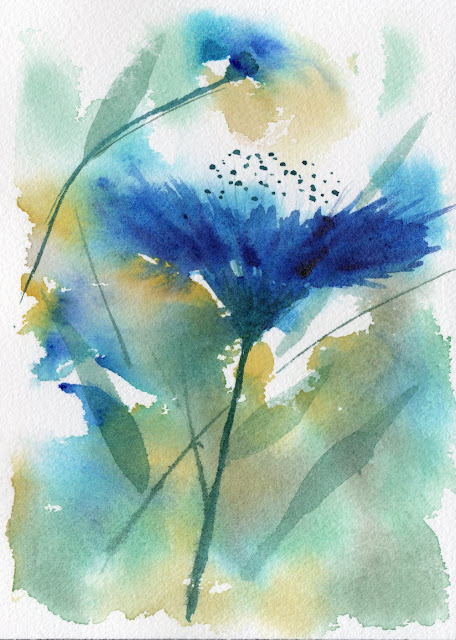 With art you can always adjust – mistakes are often just happy accidents. Remember for every great piece that Matisse or Renoir created, there were hundreds that they discarded so that you could enjoy the ones known worldwide. 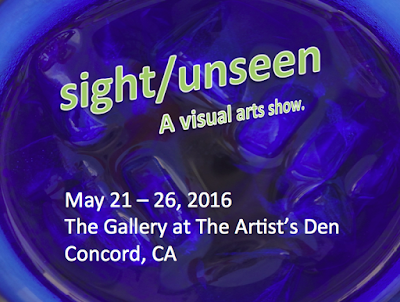 This month we are featuring interviews with the artists who are part of our upcoming art show - sight/unseen - at The Artist's Den in Concord, May 21-26, 2016. 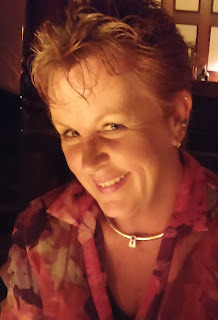 This is Michelle Morey - what do you like most about living in Concord? I have been in the Bay Area for almost 30 years and I feel blessed to be surrounded by such amazing creative energy and beauty. Having worked in Concord less than a year, I am new to the area and quite impressed by how open and supportive the community of artists here have been. 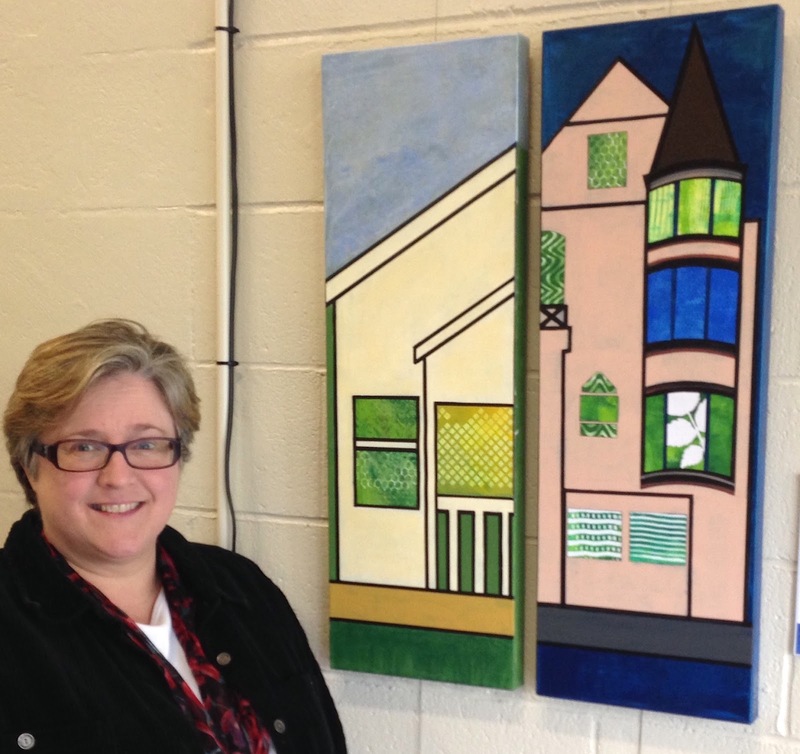 I manage The Artist's Den, a gallery and studio for adults with developmental disabilities. We opened in June of last year and have been well-received by the community. The comment I hear from most artists who stop by is, "This is wonderful, but we need more gallery space!" What mediums or techniques will you be using for your piece? I will be working with both old and trusted mediums and trying some new things. This project is a challenge on several levels. I have spent years dedicating my energies to supporting others in their creative endeavors while setting mine aside, but also my vision is changing and I am coming to terms with the real possibility of losing my vision. I am exploring the impact this is having on my life and my art. I love to paint, but I need to let go of the fine detail work I enjoy and am now leaning more towards texture and color. I have a sense of where I would like for this piece to go, but it feels very organic. Giving up control, learning to do things differently and acceptance seem to be the lessons here. How long have you been creating art? I have been playing with art all of my life. My mother was a very creative person and if Barbie needed clothes or a home, we made it. We were always making things - painting, refinishing, sewing and sanding. My mom was never afraid of making mistakes or making a mess, which is what she taught me. 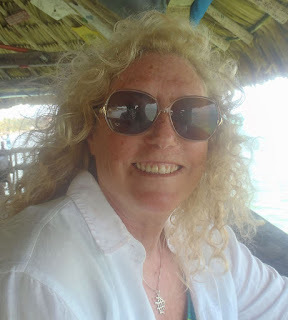 She also taught me not to worry too much about following the rules or directions, which can still get me into trouble. I feel pretty lucky to have grown up with that kind of freedom, because it kept my creative spirit alive and I have never been afraid of getting my hands dirty. My boss doesn't always love me, though. 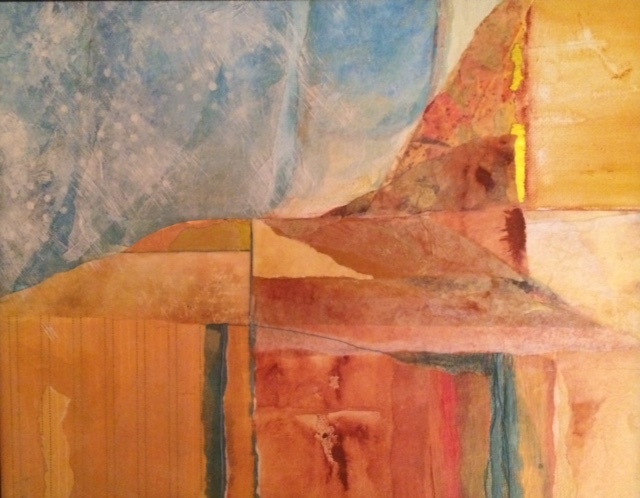 This month we are featuring interviews with the artists who are in our upcoming art show - sight/unseen - at The Artist's Den in Concord, May 21-26, 2016. 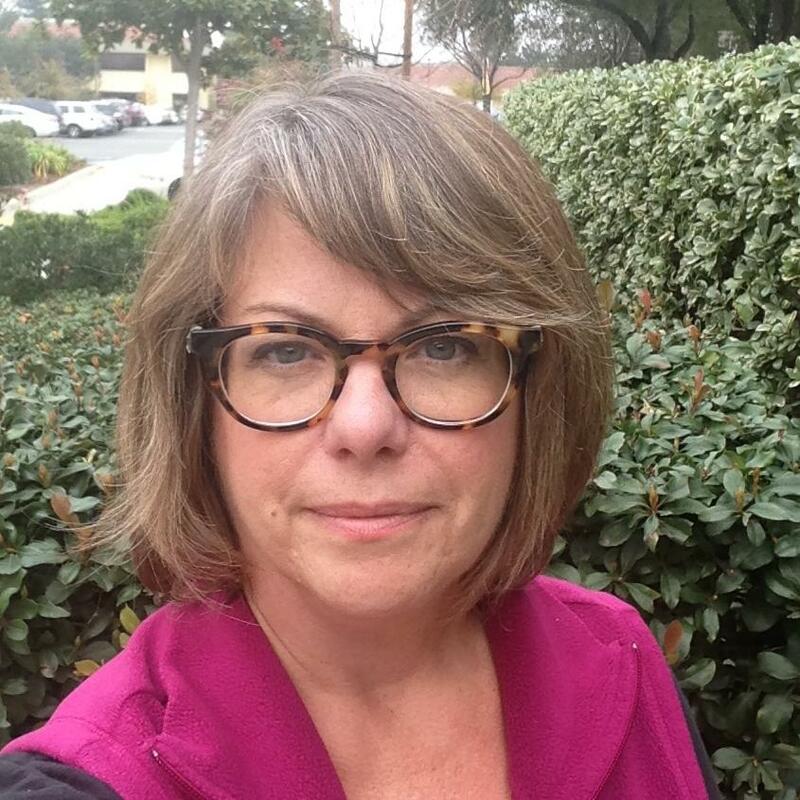 This is Sylvia Nuzzo Philis - what do you like most about living in Concord? I’ve lived in Concord nearly 10 years, and in nearby Walnut Creek for 5 years prior to that. At that time, 15 years ago, I had just ‘landed’ in the East Bay after making the move from western Canada. I find there are so many ways to enjoy the area, mainly through nature and being outdoors. The mild/warm weather, Mt. Diablo, walking/cycling trails, proximity to ocean and mountains - this is all very valuable for me as an artist. The more I become involved in the community, particularly the arts community, the more likable Concord is to live in. What medium(s) do you plan to use for your piece in the show? I generally use photography in some way for my art, although it’s not always in the traditional form. If there are ways I can distort a view or put a twist on a process or technique, that's when it becomes most interesting for me, so I’m always willing to change things up. However, in realistic photography, I am very drawn to a photojournalistic style. Here again, I like to make visible what is perhaps not usually always seen or obvious. My approach to art-making often falls towards finding a solution to a problem, or an answer to a question. My attention lately has been less focused on my particular art-making skills or art practice, but more about my practice of community-building through the arts. Much like any creative practice I have, I am constantly thinking about it, I take some action every day in order to make progress, and consider the progress made as somehow making a difference in the world. Although making a difference in the world is a bigger responsibility when provoking and supporting community art as I have been doing lately. Not only does it have to make a difference for myself on a personal level, but when you engage at a broader level you want it to have a positive effect and outcome for the parties involved and the public at-large. I’ve been an artist since I can remember. For many years it was performing arts that consumed me: music, theater, dance…and when I began to take dance seriously, I found that it was choreography that I became most engaged in; the making of dances, the elements of composition, the use of space, and the message or form that was conveyed. This turns out to be the same priorities for my visual artwork. My training has been eclectic and therefore I consider much of my mentorship to be somewhat non-traditional as well. I hesitate to name names for fear of neglecting to mention someone totally obvious, but if I were to mention one person, it would be the late, great David Adams, who was the first principal danseur for the National Ballet of Canada back in the day. I had the honor of having him as a teacher for 3 years while I was studying dance at the college level. He was so wise and so subtle in his ways of making us dance beyond what we imagined our abilities to be. He was a very gifted dance artist and uniquely generous in sharing his artistry with his students. What advice do you have for new artists? There is no shortage of advise for art students…I keep the same approach for my artwork as I do for most things, but it’s even more critical for artists…simply, if it’s important to you, then make it a priority. This is Sharon Petersen - what do you like most about living in Concord? It was early 1980 when I moved to Clayton from Chicago and I immediately felt “at home,” and each subsequent year has only solidified that feeling. From the oak-covered emerald green winter and spring hills to the clear blue summer skies leading to our long glorious fall, there is no better place to live or to be inspired to create art based on nature. The only challenge I've experienced is the extreme heat in summer which makes it difficult to paint en plein air. What medium(s) do you plan to use for your piece in this show? As a professional landscape designer, I had always worked with graphite, markers and colored pencils. After I retired three years ago, I tried watercolor painting for the first time, as I had always promised myself I would do. I fell in love and haven't tried anything else since. There is so much to learn in this medium and I know that I haven't scratched the surface yet. I'm content to stay with my watercolor practice, but I may surprise myself and add another media. My vision seems to be begging for additional texture of some kind. 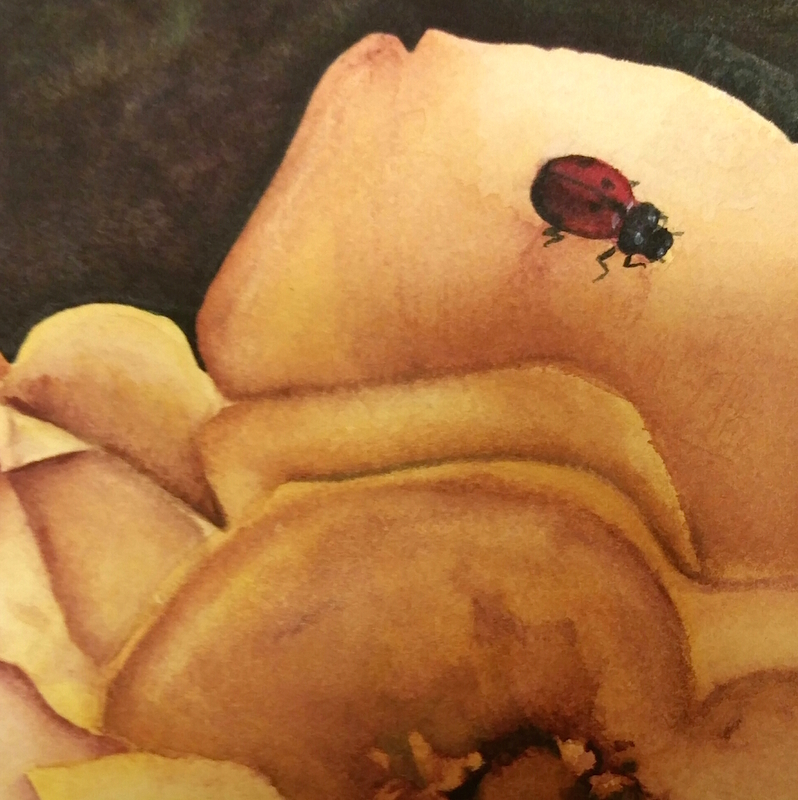 I learned about using watercolor ground on stretched artist canvas, then painting over it in watercolor. This excited me as it opened new avenues for textural experimentation. The work also needn't be framed using this method. I always felt the need to be creative no matter what direction my work took me, from the fiber arts to black and white photography and dark room work to landscape design. It wasn't until I studied with architect Christopher Grampp that I learned that “everyone can learn how to draw.” Eventually I came to believe that. What's the best piece of advice you've received as an artist? Grampp also taught me that the only way to improve is by practicing every day. This has been true for me in pencil sketching and watercolor painting - I now strongly believe this! Use good materials and practice every day. Accept from the start that most of your work won't be a masterpiece and you won't be disappointed. This is Laurie Mansur - what do you like most about living in Concord? I love living in Concord because it provides the best of many worlds. It's a small town in the midst of a major metropolitan area, so we get to have the quiet, slower pace, open space and access to nature, but also we have many influences of the cities of Oakland and San Francisco, like a rich cultural and economic diversity. What medium(s) do you plan to use in your piece for this show? This piece will be something new for me, and it has been both exciting and terrifying. I typically paint in oils or pastels, but this project is going to be a bit more mixed media. So I'm exploring both internally and with the media. I am totally out of my comfort zone, which is a really good thing. I'm not sure where it's going to end up to be honest, but I like where it's going so far. 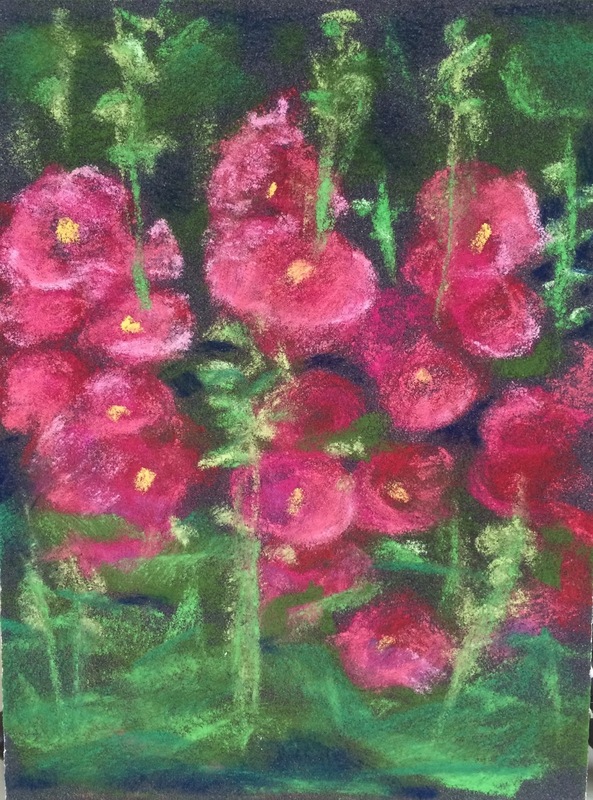 When I started using pastels about a year ago, it was very freeing. I was looking for ways to keep my strokes loose, so I learned to paint with pastels without smudging or blending them, just layering. In this way, every stroke is important and choosing the correct color is also important with each stroke. I have to really analyze what I see and get it right the first time, otherwise it's easy to make a muddy mess. I have been making art since I was little. Drawing, crafting, painting...those were all favorite pastimes growing up. I studied art history in college, and so I learned about world history, politics and religion through its art. What has been the best advice you've received as an artist? I really started growing as an artist when I met Patsy Taylor. 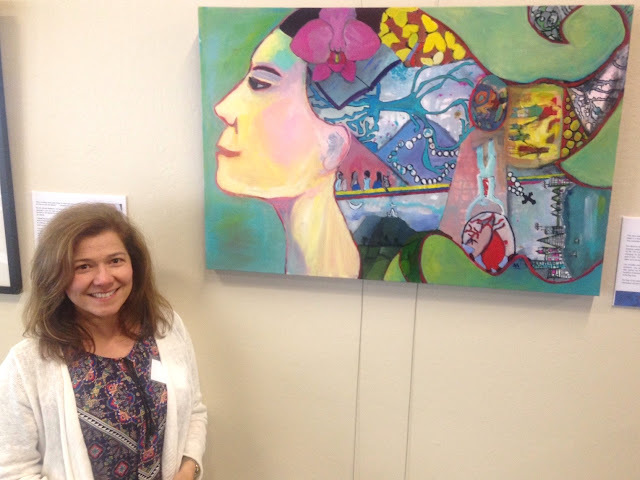 She is a local Concord artist and also a wonderful teacher. The most important thing she taught me was to keep trying - that art is like other activities, in that there are basics you must learn in order to be successful, and that anyone who wants to make art CAN learn to do it. We so often associate art with talent and assume that artists are born being able to draw or paint or sculpt, but the truth is we have just spent probably more time learning and practicing than the average person. What is your best advice for a new artist? I would say two things - first is to learn about the business side of art when you are starting out. Realize that if you are an artist, you will likely also be an entrepreneur, so what does that mean in terms of making a living? What will your options be? It's important to remember that in order to do what you love you have to be able to support yourself (unless you are lucky!). And the second thing is don't give up. If you want to be an artist, do it and don't let people talk you in to a more "practical" career. There are so many options, but you really have to be an advocate for yourself and your future. This is Kim Lawson - what do you like most about living in Concord? I have lived in Concord since 1992. Although it's the largest city in Contra Costa County, there's still a small town vibe here. I like its proximity to San Francisco and other great locales in the Bay Area. I feel lucky to be able to hop in the car for a quick road trip to the many wonderful places within California. I recently began teaching art journaling and general craft classes through the City of Concord’s Park and Recreation Department. 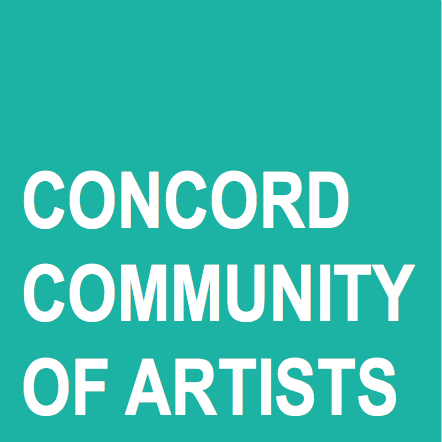 I'm a member of the Concord Community of Artists and the Concord Art Association - two inspirational groups that I'm proud to be a part of. There are many talented artists living here - I would love the City of Concord to better promote and have more outlets for art and artists! 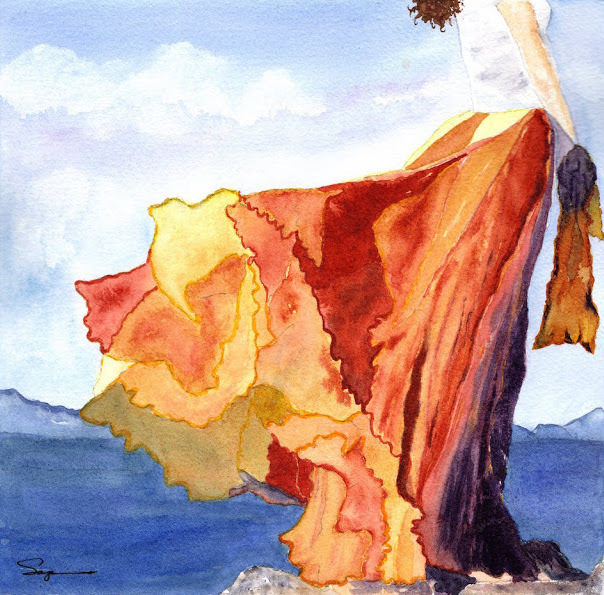 Generally my work has focused on photography, acrylic and watercolor painting, as well as various forms of mixed media and crafts. 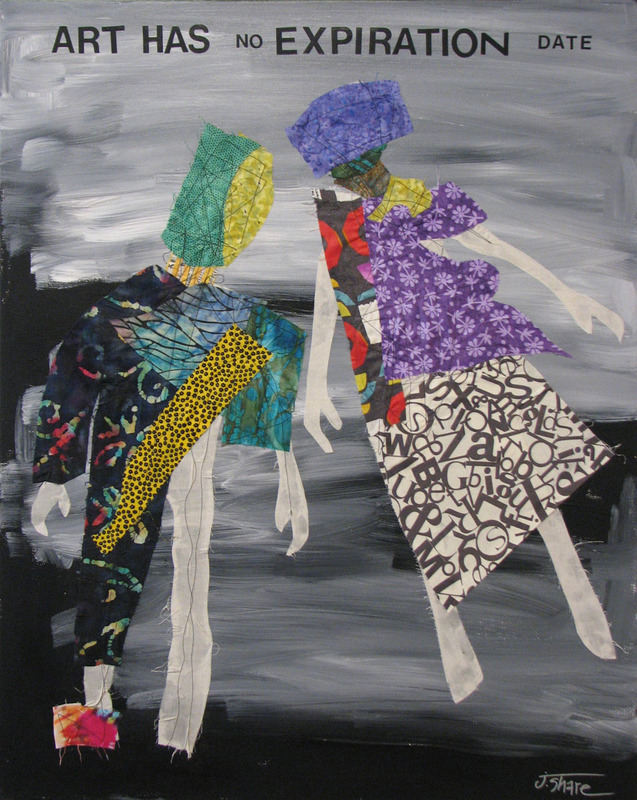 For the sight/unseen show, I plan to step outside of my comfort zone and try something new. Yikes! What I envision in my mind does not always present itself in the final stage, but I like to push my boundaries and see what happens. Sometimes the result is better than I anticipated! I will be creating a 3D piece exemplifying my heritage and its influence and translation to my artwork. Are there exciting mediums or techniques you've learned about recently? 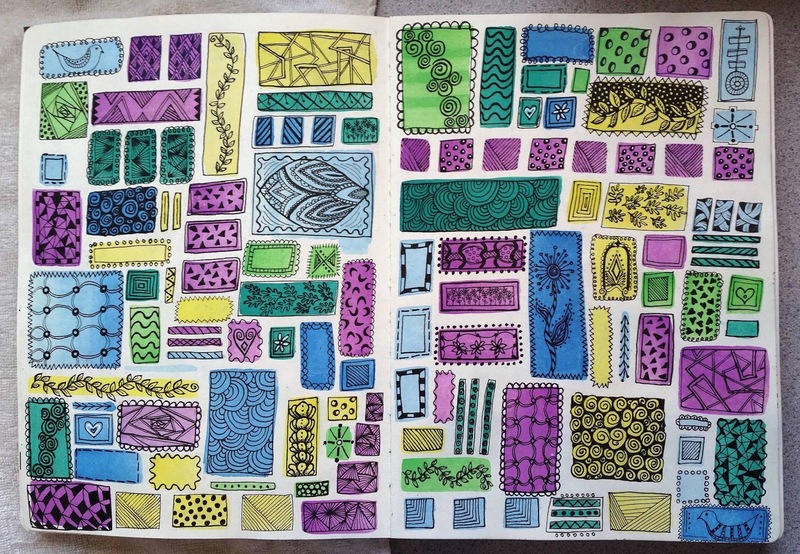 Last year I began art journaling – a place for me to experiment and practice ideas. Whoa! I fell in love with this creative outlet so much, that I now teach this art form to others. I carry a small journal and pens with me at all times because inspiration can happen at any time. I have a large journal that I play in every day. Sleeping is difficult sometimes when ideas keep knocking on my brain! I like to think that I was born an artist. It's strange for me to consider myself as an artist because I’m no Picasso...I just make what I think is fun and whatever comes naturally to me. Technically speaking, I have been labeling myself as a self-taught artist for ten years. Additionally, I think I am misplaced royalty – probably 201st in line for the English crown. I have no formal art education, but being Queen won’t require that. But I have always drawn and sketched - it's a great way to stay focused during boring class lectures and business meetings! 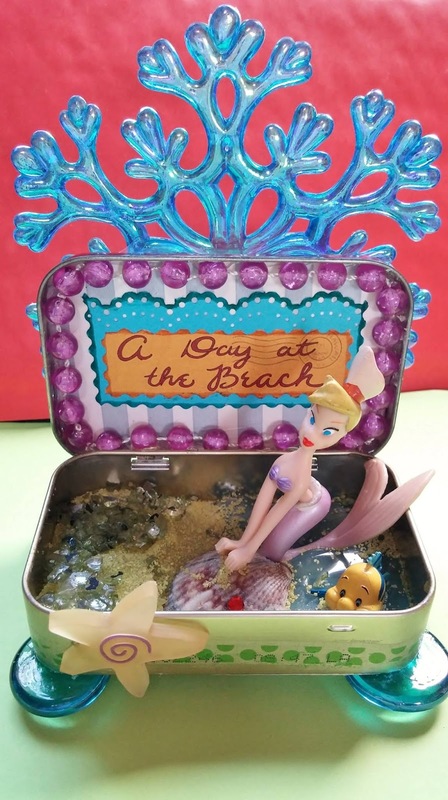 I also adore creative writing, papercrafts, repurposing things, and using weird collections of objects I find to enhance my projects. I find inspiration from master artists, fellow artists, and a wealth of museums, nature, and friends whose style I admire. The best advice I have for budding artists is to give into the passion and desire to create, don't give in to the fear of failure. You can always paint over it! 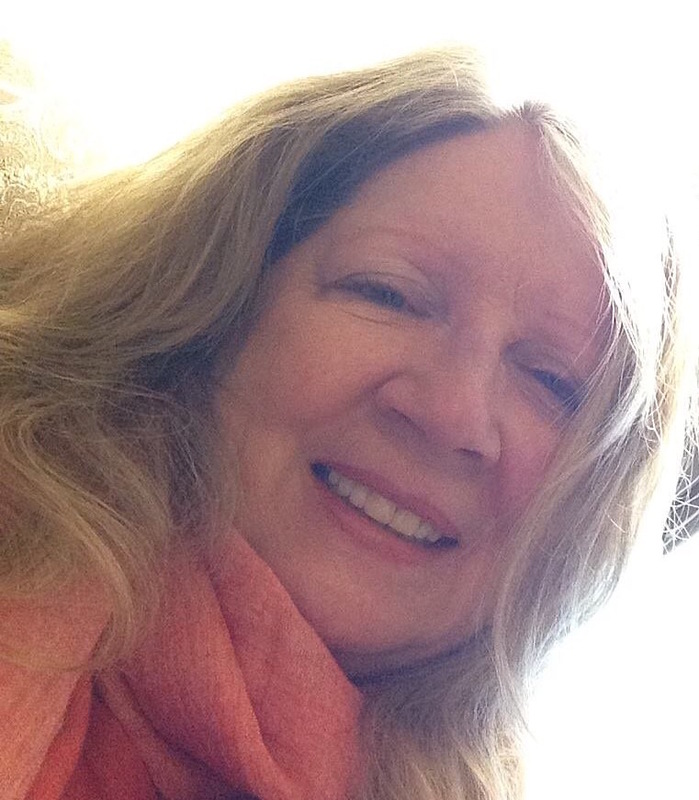 This is Catherine Hensiek - what do you like most about living in Concord? I like that my neighborhood in Concord is surrounded by numerous trails that criss-cross the foothills of Mt. Diablo. Driving east on Ygnacio Valley Road and gazing on our beautiful mountain and the surrounding hillsides allows me to mentally escape the congestion of the rest of Central County. 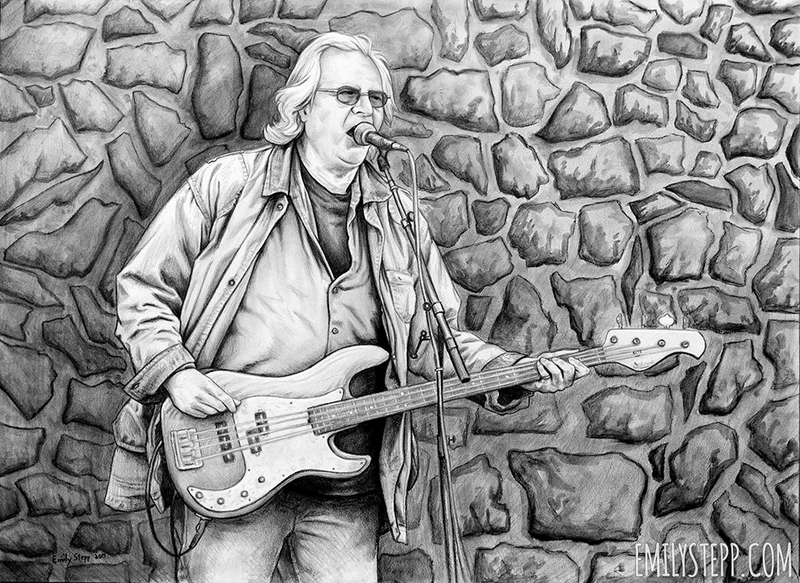 I love that downtown Concord is centered on a historic square that provides a focal point for music, art and food. I enjoy the diversity in our community that provides us with festivals and world cuisine. We moved here in 1985 and the small town we first considered a way station on our journey to a big city has become our hometown. The natural beauty of our area is a constant inspiration for my art. Every morning I look out at Mt. Diablo and marvel at the ever-changing vista. The challenge I find is to take full advantage of all the activities that our town offers. What medium do you plan to use in your art for the sight/unseen show? For the piece I am doing for sight/unseen, I will be using mixed media techniques including acrylic paint, collage, ink, gouache and some three-dimensional aspects. Some of this is familiar, but with a twist for this piece. I enjoy learning new techniques, which is why I am always taking classes. Are there any exciting mediums or techniques you've learned about recently? During the last month I have been learning to make small books, which is something I have wanted to do for a long time. I am very excited about translating some of the book making techniques I have learned into other projects. I have been making art most of my life. As a child I was always creating paper dolls of all different historic eras. I took art classes in high school and college even though art was not my major. Although I spent a number of years in the corporate world, I did have an interim career as a designer. Retirement allowed me to jump back into the creative world. What is the best advice you're ever received as an artist? 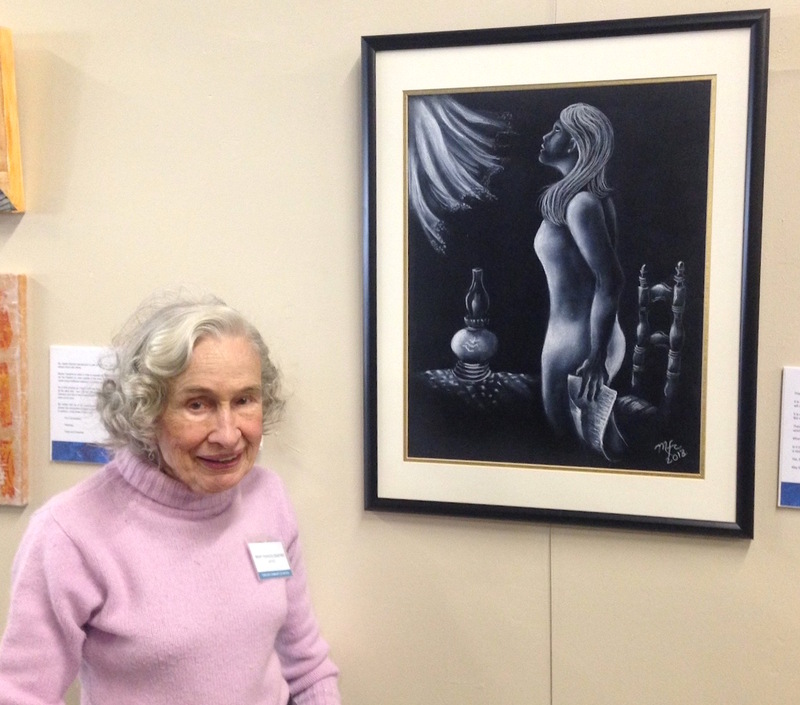 The person who has been the biggest influence on my art has been my painting teacher, Patsy Taylor. She helped me learn the techniques and principles of acrylic painting including composition, value and color. The best advice Patsy gave me was to draw or paint every day. It does make a difference in that it helps to train both my eyes and my hand! 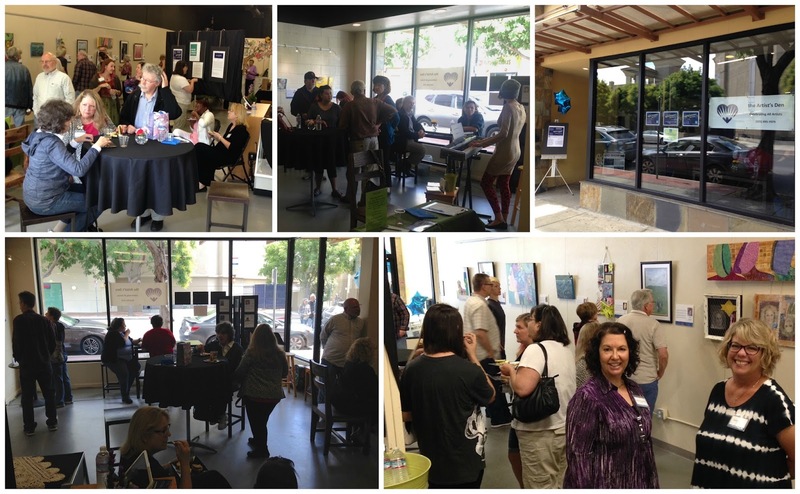 For anyone wanting to explore becoming an artist, I suggest checking out the large number of classes offered in our area through Walnut Creek Civic Arts, Mt. Diablo Adult Education, Acalanes Adult Education and Concord Parks and Recreation. A little past, a little present, a little future. Flowers are continuing to grow! Beauty unfolds before your very eyes! © 2014 Concord Community of Artists. Simple theme. Powered by Blogger.